It's the ultimate nightmare. One minute Shinichi Izumi is a normal teenager asleep in his bed. The next he's been infected with a deadly parasitic organism determined to devour his brain and turn his body into the planet Earth's new apex predator. But Shinichi partially foils the attack and, instead of being consumed, finds that the creature known as Migi has taken the place of his right hand. Now forced to share the same body, the two must become unwilling allies. Migi isn't the only one of his kind, and unless human and parasyte work together, they'll both be killed as abominations. Prepare yourself for a horrifying new world where the survival of the fittest and the survival of the human race are no longer the same thing. 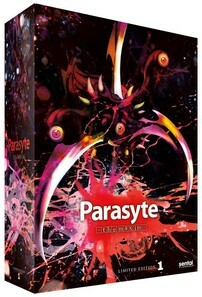 Monsters lurk behind every corner and every face as the human race becomes prey in Parasyte ~ the maxim! Contains episodes 1-12 plus a chipboard box, microfiber cloth, tattoo set, green-eyed Migi [email protected] collectible figure from Medicom Toys (exclusive to the Parasyte collector box set).